Blueberry season has arrived early this year! After another warm and sunny winter - BC is already mid-season! That means lots of big, juicy, delicious blueberries are available now! 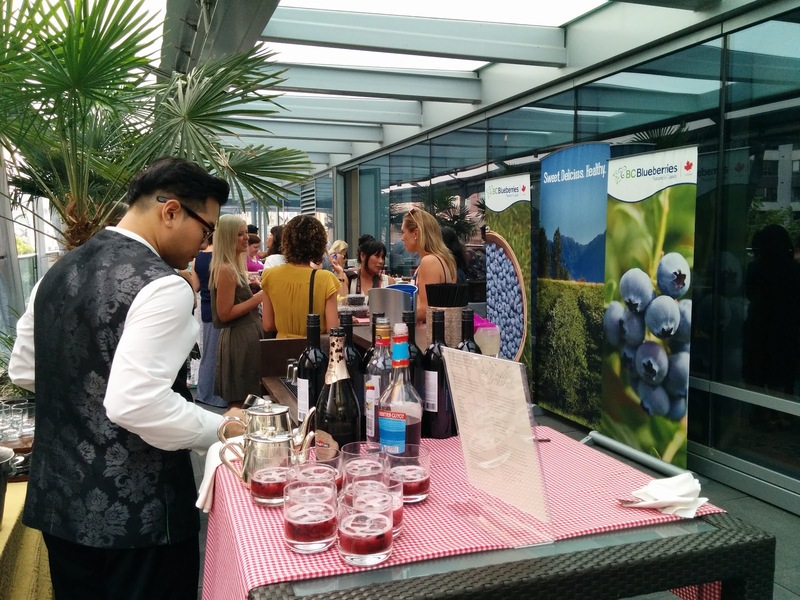 I was invited by BC Blueberries to take part in a "picnic" party at the Shangri-La Hotel downtown on Tuesday to celebrate another strong blueberry season. The point of the menu was to showcase the versatility of blueberries. They are not just for muffins or pancakes; they can be used in savoury dishes as well. We started off at the bar with sweet boozy drinks of crushed blueberries and strawberries then noshed on some canapés that featured or used blueberries to complement it. Blueberries are one of my favourite summer fruits and with the abundance of yummy blueberries, it's the perfect time to freeze some for the winter! Check out BC Blueberries' site for information about blueberries and recipes to put those delicious blueberries to good use!